Fairtrade Australia and New Zealand today announced the appointment New Lady of Molly Harriss Olson as Chief Executive Officer (CEO). 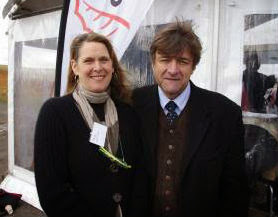 The Olson previous Chair of Fairtrade International joins the organization at a main time. Fairtrade Australia and New Zealand, which has seen significant increase since its inception Ten years ago and is now Australia and New Zealand’s most recognized ethical label is looking at ways to get bigger even further. The depth and breadth of experience that she brings to Fairtrade will be priceless, said Valentine Tripp, Chair of Fairtrade Australia and New Zealand and a Director with KPMG. In her time as Chair of Fairtrade International, she has been pivotal in renovate the governance of the international organization and driving change, including the introduction of the new Fairtrade Sourcing Programs. An internationally recognized leader in global sustainability, Olson is experience spans over 30 years. She worked in the White House during the time of President Bill Clinton as the Founding Executive Director of the President’s Council on Sustainable Development, developing a general action strategy on sustainable development. More recently, in Australia Olson founded and convened the National Business Leaders Forum on Sustainable Development, and was in charge for bringing Al Gore on his first visit to Australia as keynote speaker for the forum. Molly Harriss Olson said: I am fervent about the Fairtrade movement and the opportunities we have in make easy tangible impact to make trade fair. An exacting highlight for me has been overseeing a change to the constitution of Fairtrade International which has meant that producers and workers in the Fairtrade system are now half owners, enabling them to have a powerful voice in the system. After one years at the international level of Fairtrade, I am looking forward to the challenges of working at the national level and leading the organization to build on its success so far, and grow the market to even greater levels, said Ms Olson, who will be based at the Fairtrade regional head office in Melbourne. Ms Olson’s appointment comes on top of another new top-level appointment at Fairtrade ANZ. Valentine Tripp, a leading FMCG specialist and Director with KPMG, was selected as Chair of the Board of Directors at the end of 2013. Fairtrade International has introduced their Standard for Hired Labour, marking a main step in the organization’s attempt to extend its work beyond Fairtrade Premium projects and basic labour rights protection. The Fairtrade International Standards Unit traveled the globe to meet with more than 420 workers in 14 countries to develop the new document. They also interviewed close to 170 management council from Fairtrade certified plantation and factories, and received more than 120 written response from certified producer groups, traders, retailers, unions, Non-Government Organizations, and member organizations. The result is a new Hired Labour Standard based on the principles of the workers rights plan, but grounded firmly in the everyday reality of Fairtrade workers across 3continents. The Fairtrade Hired Labour Standard applies to organizations produce flowers and plants, fresh fruit and vegetables, tea, coffee herbs and herbal teas, and sports thinks. The Standard has necessities on freedom of association; benchmarks for companies working towards the living wage, supplies for the use of migrant labour and giving workers the power to decide on how the Fairtrade Premium is invest.